1965 Accumatic A-604... or is it? The 1960's was a dynamic period for Hamilton. They were very busy with integrating acquisitions like Buren, joint ventures with Ricoh, and introducing lots of new models with US-made and Swiss-made movements in manual winding, automatic or Electric grades. I guess you could say they were "pulling out all the stops" to compete in a rapidly evolving watch industry. 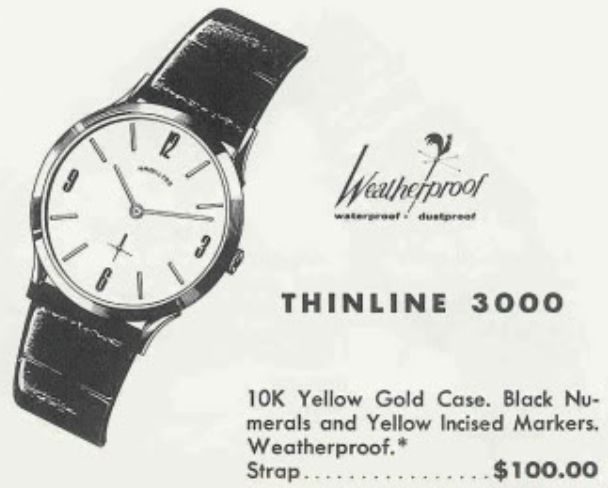 One of the new models that lasted only a year was the Accumatic A-604. The Accumatic A-604 came in a 10K RGP case with a matching expansion bracelet. It has a unique-looking dial with applied markers, a thin golden ring towards the center and a golden reflector ring around the perimeter. Inside the watch you'll find a 17 jewel Hamilton 694A automatic movement. I recently landed an A-604 project watch and it wasn't until I started to think about the blog that I began to wonder about it. 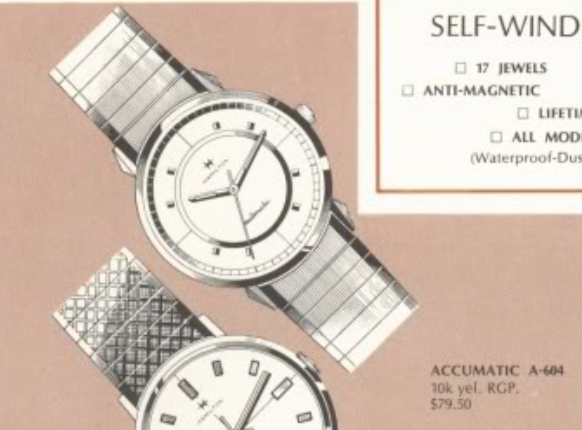 If you look closely at the catalog image and then at the actual watch, the lugs on the project watch case are slightly different. Is this a replacement case? Also the hands aren't an exact match either. The dial has a couple of scratches above the word "automatic". It looks to me like someone tried to remove a spot but instead made things a little worse. Fortunately they stopped. Flipping it over, the deep pie-pan case back clearly contains an ETA automatic. The crown is a replacement but that's not unusual, especially on water-proof models. With the crystal lifted out of the way, the golden reflector ring is printed with minute marks and larger lines at 5 minute intervals. Some of the printing has been lost to time. The second hand has a red arrow tip. That's not shown in the catalog but it could still be original... it wasn't uncommon for Hamilton to use what they had on hand when it came to the busy seasons of Christmas and graduations. Everything fits nice and snugly so all the signs point to this being the original case, but it's not an exact match. Maybe getting cases for this model was difficult, which was why it was a one-year wonder? Beats me. Lifting the reflector ring exposes the seam in the two-piece stem. Now the movement and dial can come out. This movement is filthy and obviously hasn't been properly cleaned in a long time. It's also missing one of the dial foot screws. Fortunately there is no rust anywhere, so this should clean up nicely. Based on the case markings this is clearly a Hamilton case. The six digit model number ending in 64 would be a clue that this was a 1964 model. 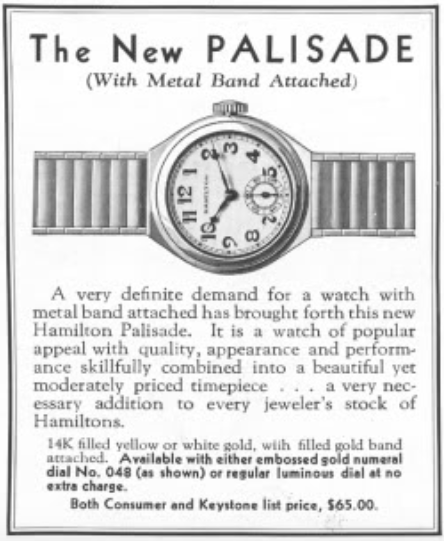 Hamilton watches were introduced in the Fall of the preceding year, so maybe that's why this has a 64... I don't know for sure. I don't recognize the case maker logo and the printing inside is heavier than typical but I have not doubt that it's a legitimate case. With the dial and hands removed, the dial-side of the main plate is just as dull (dirty) as the back, but there's no rust to be seen. Everything is cleaned and dried. I didn't do too much to the reflector ring, as I didn't want to lose any more printing, although it might look better if I polished it up a little. Everything else looks nice and shiny, just as it should. The movement is running but it took a little tweaking to get it to start. I had to get the balance to be positioned just right to get it to swing. I have a feeling the balance is not "in beat", meaning not lined up properly with the pallet fork. Initially I thought I was in the clear, as the two lines on the timer were right on top of each other. Then the beat error showed up on the screen. 9.9ms is the maximum the timer will go so my suspicions were justified. Fortunately, the beat error is easy to adjust. Notice the position of the gray-silver tab at the bottom of the shot below. It looks like there's a little triangle on the main plate pointing at the tab. That is the location of the hairspring stud. If that tab is moved the balance moves with it. At the other end of the hairspring is the balance staff and the impulse jewel that engages the pallet fork is fixed to the balance staff. So if you move the hairspring stud, you move the impulse jewel and the goal is to center the impulse jewel with the pallet fork. The 9.9ms error means the impulse jewel is far from being centered. My guess is the tab needs to move clockwise - because it really can't go the other direction. Notice the position of the tab now... it's no longer aligned with that little triangle mark. The beat error has been reduced to 7.0ms... that's still way too high but it's moving in the right direction. Now I've moved it again... just a little further. Getting warmer but still not quite there. On watches with a fixed hairspring stud I would be tempted to stop but this watch is so easy to adjust I would feel guilty not getting it even better. You may not be able to tell I moved it but I moved it a little more clockwise. 0.4ms... not too shabby. I could be even better but we're talking a very small adjustment at this point and anything less than 1.0 is acceptable in my book. Now I can tweak the regulator index to speed the watch up. The regulator index controls the effective length of the hairspring. A shorter spring beats faster than a longer spring so moving the regulator index lengthens or shortens the spring, depending on where you move it. In the shot below, the regulator index is the tab with two golden dots. Those dots are actually prongs of the regulator fork that holds the hairspring. If you compare the shot below to the shot above, you'll see I moved it away from the hairspring stud tab I used to adjust the beat error. By moving the regulator index away from the hairspring stud, I shortened the spring and made the beat rate speed up. There... the beat rate and beat error are just as they should be. The amplitude of 237 degrees is fine, I haven't fully wound the watch yet because there is no crown on the stem. I can put the oscillating weight back on and get the movement ready to be reinstalled in the case. Notice how bright and shiny it is after a trip to the spa. A 30.6mm GS PHD crystal should do the trick when it comes to closing up the one-piece case. The finished watch looks great with a fresh lizard strap and a new crystal. The crown looks a little larger than perhaps it should be, but it's still very small. At least there's enough "meat" there to wind the watch and set the time - sometimes crowns are so small they're hard to grab ahold of. I still don't really know what to make of the case... is it original or is it from another model? One thing is for sure, it's clearly a Hamilton case so I suspect it left the factory this way. 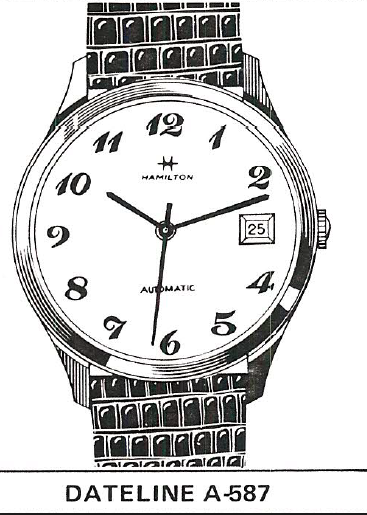 It wasn't unusual for Hamilton employees to work 30 or more years for the company. So it's conceivable that a few employee careers might have spanned the 40 years between 1930 and 1970. That means someone might have said, "Hey remember the first style of printed numerals we used? Let's use those again but on one of our fancy new automatics." And thus was born the 1971 Dateline A-587. It was only offered for a single year. The Dateline A-587 is an interesting blend of old and new. There were no sweep second movements in Hamilton's lineup when this interesting font of numerals was first used. There were no automatic movements or calendar complications either. It reminds me a little of the 1931 Palisade. The Dateline A-587 came in a one-piece stainless steel case. Tucked inside the case is a 17 jewel Hamilton 694A movement made by ETA. I recently happened upon an A-587 and I was a little confused when I went to identify it. It's very 1960's looking and the dial is quite distinctive. I wasn't able to identify it immediately so I thought perhaps it was one of the M-series of models. However, a fellow collector helped find the error of my ways and I found it in the 1971 catalog. As received, the watch was rather beat up looking - or at least the crystal was - but the rest of it was in great shape. The one-piece case is unmarked by any previous attempts to open it incorrectly. Check out the model number... 986064. That was one of the reasons I thought it might be a 1960s model - the last two digits of this number typically indicates the first year of production. So does this model share a case with an earlier model? Could be - a lot of crazy things happened in the years surrounding 1969. The 694A movement inside is also a 1960's movement but it was used for quite a while so 1971 isn't a stretch. Everything is taken apart and fully cleaned, although this watch was surprisingly clean to begin with and I didn't see any watchmakers marks inside the case back. Maybe this watch was dial down in a dresser drawer for the past 45 years... explaining the scratched crystal but otherwise pristine innards. This watch is very large for a vintage watch and measures 34mm wide without the crown. It has a large crystal too - 30.8mm in diameter. The partially-reassembled movement is running with good motion and is setting on the timer. Not too shabby, just a little fast. A slight tweak to the regulator index will slow it down. It didn't take much of a tweak to slow the beat rate down to 1 second fast per day. That'll do nicely. I made a quick stop to my light tent to reassemble the bits on the front of the main plate. Now I can put the dial on and set the hands at 12 midnight when the date wheel changes. The oscillating weight is reattached to it's framework and the framework is reattached to the movement. Now I can drop it back into the case, reattach the crown and set the time. Ta-da! This watch looks and runs like it just let the jewelry store cabinet. I love the look of the slender baton-style hands and they're a flat black color. The radial finished dial really shines beneath a fresh crystal. For being so monochromatic, this is a sharp looking watch. Someone at Hamilton must have had salt water in their veins, as there are 47 "sea somethings" in the Hamilton line up. You can add a couple of dozen more when you add the other nautical-named models like the Boatswain, Yeoman, and there are 24 various Nautilus models in the Electric series, for example. One of the "sea somethings" is the 1963 Sea Crest II. It was produced for two years. The original Sea Crest came out in 1958 but I haven't covered that one on the blog yet. There was also a Sea Crest III issued in 1968 that I have covered. All three Sea Crest models came in stainless steel cases with white dials but from there they are each a little unique. The Sea Crest II has an all numeral dial and a small sub second hand. Tucked inside the case is a Hamilton 686 Swiss-made movement based on an A Schild 1200. A fellow collector recently sent me his Sea Crest II and, like most of his watches, it came with the original bracelet too - which is always fun to sea. As received it was a little dirty and likely overdue for an overhaul but not too bad. The watch opens through the front so "the claw" is my tool of choice for gaining access to the movement. Without the crystal blocking the view, you can see the dial is a little dirty and my camera didn't pick up that the finish is a little different around the number 3. My friend asked me to give cleaning the dial a shot, as he was on the fence with getting the dial redone. This dial could be redone nicely since it's not a radial finished dial, so I'll give it my special treatment and a "poor man's refinish" to see if I can improve it. Oh yeah, this is a dirty movement. No doubt about that. Everything is cleaned and dried. Next step, reassembly with four different lubricants. The reassembled watch is running with nice motion. That's a good sign. Notice how brighter and shinier the watch is after a trip to the spa. Pretty much right on the money. The amplitude is a little low but it's over 200 and I haven't wound it fully yet since there is no crown attached to the stem. Well, I would say my dial cleaning and light spray of clear lacquer made a nice improvement to the dial. It still has some of it's original spots but if you were born in 1963 I bet you have a few spots here and there too. This dial certainly doesn't need to be refinished, that's for sure. There are 83 different Thinline models but only two of them are solid 10K gold. One of them is the 1960 Thinline 3000. It was produced for only two years. 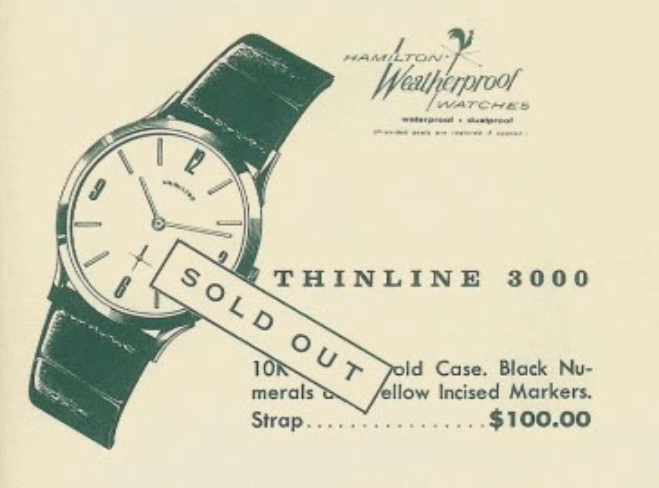 The 1961 catalog showed the Thinline 3000 was "sold out", so maybe it was only available for one year? I recently landed a Thinline 3000 project watch and upon close inspection it looked pretty good. The dial has a slight tone near the three, indicating that water has gotten past the crown and affected the dial. The black numerals are uniquely shaped with a very thin font. The watch has a one-piece case and opens through the crystal. This watch really lives up to the Thinline name - it's extremely thin. Inside is a 17 jewel 676 movement. You don't see this movement anywhere other than in a Thinline. The inside of the case has a couple of watchmaker's marks. One of them is a simple "15". Oddly enough, once the dial was removed, I saw "15" scratched into the manipulate too. You can see the 5 in the photo below. There's a lot of extra oil under the barrel bridge. In fact the overall movement looks clean but feels grimy. All the parts are cleaned and ready to be reassembled. Everything is reassembled and running. It looks okay to my eye but the timer will tell me for sure how it's running. It's running a little slow and the amplitude is low but I only wound it a little bit. I wound it more fully so the amplitude increased. The regulator index is very finicky... I could get it to run a little fast or a little slow but the sweet spot proved illusive. I'll leave it a little fast for now. I'll put a new low profile crystal on, as the old one was a little scratched up. 30.6mm should do the trick. A nice genuine alligator strap completes the overhaul of the watch. My merciless light tent exaggerates the yellow tone near the three on the dial. It's not that obvious in daylight. The dial is a radial finished pattern and I'd be hesitant to try to get it refinished.